However, don't waste too much time on the surface as you've got to enter the underground temple and find that all-important crystal. 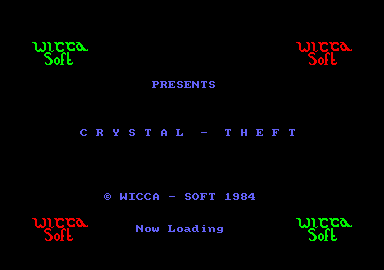 Crystal Theft isn't a new game - it was first released in 1984 by Wicca-soft but it has now been re-released by Wow. It has a fair bit going for it in the way of objects to pick up, puzzles to crack, rooms to be searched, doors to be opened and lifts to go up and down in but for me personally it has quite a few things against it - the screen layout, for a start, is poor (although you do get a useful window which lists the objects you are carrying). 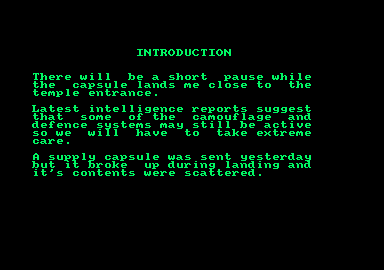 The parser at times is rusty and shows its age, "EXAMINE DOOR" gives the response "I don't have one of those" - of course we don't have the door - it's in front of us and serves a definite purpose, so why can't I examine it? Scoring is also strange -1 like games where you can look at your score and see it go up as you solve puzzles as it give you a sense of achievement. 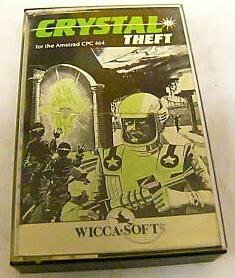 In Crystal Theft there is one particular object that when picked up adds 50 points to your score and yet it has no other use - Why? The game wasn't much fun to play and shouldn't have been re-released!